Organic molecular markers are important atmospheric constituents. Their formation and sources are important aspects of the study of urban and rural air quality. We collected PM10 aerosol samples from the Mahanadi Riverside Basin (MRB), a rural part of eastern central India, during the winter of 2011. PM10 aerosols were characterized for molecular markers using ion chromatography. The concentration of PM10 ranged from 208.8 to 588.3 μg m−3 with a mean concentration of 388.9 μg m−3. Total concentration of anhydrosugars, sugar alcohols, primary sugars, and oxalate were found to be 3.25, 5.60, 10.52, and 0.37 μg m−3, respectively, during the study period. Glucose was the most abundant species followed by levoglucosan and mannitol. 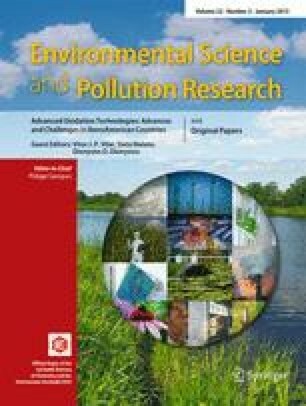 Significant positive correlation between the molecular markers, anhydrosugars, sugar alcohols, primary sugars, and oxalic acid confirmed that biomass burning, biogenic activity, and re-suspension of soil particles were the main sources of aerosol in the eastern central India study area. The authors are grateful to Head, School of Studies in Chemistry and School of Studies in Pharmacy, Pt. Ravishankar Shukla University Raipur, Chhattisgarh, India, for providing necessary laboratory support. The authors are also thankful to Department of Agro Meteorology, Indira Gandhi Agricultural University, Raipur (CG)-492 006 for providing meteorological data. We also gratefully thank the National Science Council of Taiwan (Grant Nos. NSC 99-2221-E-041-014-MY3 and NSC 102-2221-E-041-003-MY3) for financial support of this research.